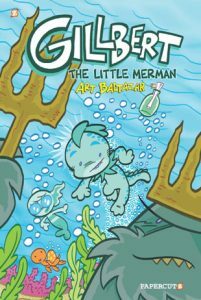 Paptercutz brings us a new full-color mini-comic series for young readers: Gillbert the Little Merman, Volume 1 by Art Baltazar (writer and illustrator of Tiny Titans and Captain Action Cat). Here’s the preview over at their web site: “In the deepest part of the ocean, unexplored by man and too deep for humans to swim, lives a little sea creature named Gillbert. Gillbert the Sea Creature is the son of King Nauticus, king of all the oceans. One day, Gillbert will be king. But in the meantime, his playful curiosity takes him away from the kingdom on a journey of discovery.Gillbert meets an amphibious mermaid and follows her into unknown parts of the ocean. Where he meets many unknown and undiscovered species of underwater creatures. He didn’t know these things existed so close to home. Gillbert’s world just got a whole lot bigger!” It’s available at comic book stores in paperback and hardcover editions. Posted in: Books and Trade Paperbacks, Comic Book News.